Through NSU's Rising Scholars program, high school students can earn credit toward high school graduation and a college degree at the same time! College-level courses in many disciplines are available through Rising Scholars, including mathematics, English, history, biology, chemistry, and speech communications. High school on-site classes are taught by qualified high school instructors who also are qualified as NSU adjunct faculty. Qualified instructors will have a master's degree in the course discipline or a master's degree plus 18 graduate credits in the course discipline. NSU and high school Rising Scholars instructors will meet regularly and work collaboratively to develop and implement curriculum. NSU faculty also support and evaluate the high school Rising Scholars instructors. Rising Scholars Program instructors also complete annual discipline-specific professional development. The NSU Rising Scholars Program received accreditation from the National Alliance for Concurrent Enrollment Partnerships (NACEP) on May 1, 2017. 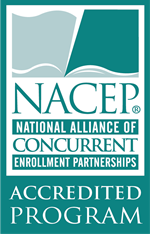 NACEP is the sole accrediting agency for concurrent enrollment. The Rising Scholars Program met the 17 standards that NACEP requires to meet accreditation. Standards are set up to ensure quality in the areas of curriculum, faculty, student services, assessment and evaluation. Visit www.nacep.org for more information. RSP credits are accepted by all South Dakota regental universities and most institutions outside the state. Students are responsible for consulting with the institution of their choice regarding transferability of credits earned. The final course grade will appear on an NSU transcript. Students can request an official transcript at Transcripts and Diplomas. Students may choose to take the AP exam in addition to receiving college credit from NSU. Complete and submit the NSU Rising Scholars Registration Form. Upon submission, a confirmation message will be sent to the email address listed in the K12 email address field. Print the registration form, sign, get a parent/guardian signature, then deliver to your high school Rising Scholars teacher/coordinator. The high school is responsible for submitting the registration form to NSU. For more information or help with registration, contact NSU Rising Scholars Director Terry Piatz or a participating high school. A one-semester survey of chemistry. Not intended for those needing an extensive chemistry background. Introduction to the properties of matter, atomic structure, bonding, stoichiometry, kinetics, equilibrium, states of matter, solutions, and acid-base concepts. Prerequisite: MATH 101 , MATH 102 , MATH 115 , MATH 120 , MATH 121 , MATH 123 or MATH 125 Co-requisite: CHEM 106LCHEM 106/106L Rising Scholars Prerequisite Exception: Two years of high school algebra (1 year of Algebra I and one-year of Algebra II) and a high school trigonometry course (which may be taken concurrently) satisfy the MATH 101 prerequisite. Surveys the background and development of the United States from its colonial origins to the Civil War and Reconstruction. Introduces the study of speech fundamentals and critical thinking through frequent public speaking practice, including setting, purpose, audience, and subject. Registration in English and math courses will require placement according to ACT/SAT/ACCUPLACER/SmarterBalance test scores. The South Dakota Board of Regents requires that placement for math classes be based on a minimum Math Index (MI) Score. The MI is a calculation of students' ACT Math score and Cumulative Grade Point Average (CGPA). Below is an MI Calculator, provided as an initial “unofficial” indicator of students' placement eligibility. Enter the ACT Math score and current CGPA in the corresponding fields below. Next to each math course there is a Yes/No field. A “YES” response indicates the student may be eligible for placement. The official MI calculation will be completed by NSU at registration. Rising Scholars students have all rights and responsibilities of NSU students. For more information, see the NSU Catalog and NSU Student Handbook. Students are responsible for paying tuition for Rising Scholar courses. Rising Scholars students pay $40 per credit hour ($120 for a 3-credit course and $160 for a 4-credit course). Tuition payments are due no later than published fall/spring census dates. Payments may be submitted via SDePay (electronic check or credit card) in a student's Self-Service Banner account, or mailed to NSU Office of Continuing Education: 1200 S. Jay St., Aberdeen, S.D. 57401. Students/high schools are responsible for textbook and lab costs. Participating students may provide feedback on the Rising Scholars courses and program. Student feedback is crucial to help ensure the program meets participating students' educational needs. When you receive the notification to participate in the evaluations below, please respond. 1. A student evaluation is available for every course. The course evaluations are administered by participating high school administrators. 2. High school graduates who participated in Rising Scholars courses will receive a survey within one year after high school graduation. The survey will be announced via email to the personal email address provided on the Rising Scholars registration form. The survey takes 5-10 minutes to complete. The survey provides feedback critical to guiding Rising Scholars program improvement, and assesses student satisfaction with the program. 3. Randomly selected Rising Scholars students will receive a survey four years after high school graduation. The four-year survey feedback is needed to evaluate long-term benefits to Rising Scholars participants. Rising Scholars classes may be cancelled prior to the individual Rising Scholars course established Census Date. More than 50 percent of the students enrolled in the high school class must be registered for college credit. Classes are subject to minimum enrollments (eight students). Individual high schools participating in the NSU Rising Scholars program are responsible for providing disability services required by students enrolled in Rising Scholars Courses. Students will need to follow their high school's disability services policy. The Rising Scholars Program is not associated with the Advanced Placement (AP) program or the NSU Center for Statewide E-Learning.